The Estelle 14 Pendant Lamp is modern materials and mid-Century styling at its finest. 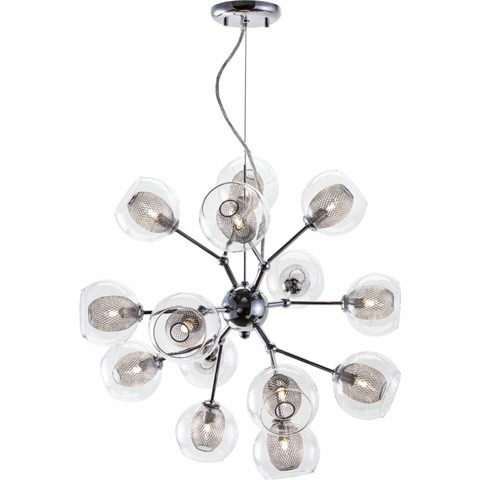 Boasting a chromed steel canopy and body, Estelle features six arms that angle off and split into 14 different heads. Each fixture includes an oblong mesh steel diffuser and 4.5" diameter glass shade, ensuring you a warm, subdued light ideal for your space. Estelle includes a 98" cable, allowing you to adjust the overal height of the fixture all the way up to 108" total! Estelle requires 14 G9 pin 40W max bulbs (included).